So you think you know "Old Time" Radio? 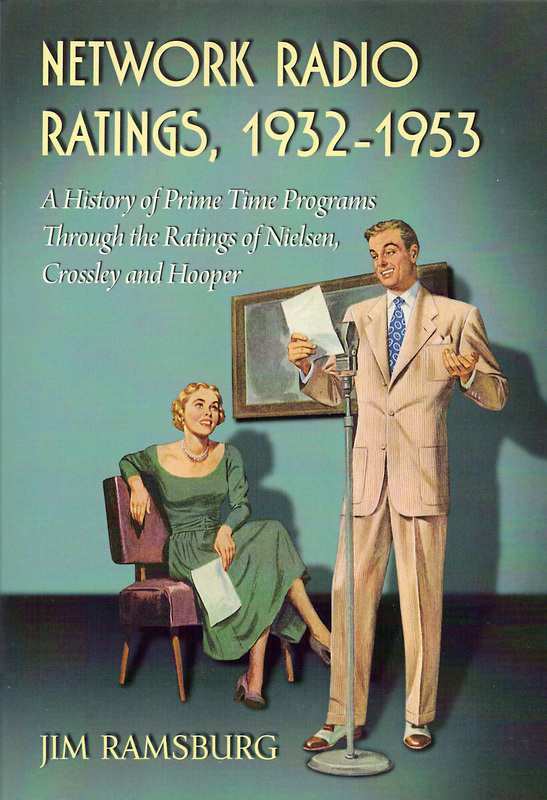 These 25 questions are drawn from my book, Network Radio Ratings, 1932-1953, which identifies and ranks the prime time programs from all 21 years of Network Radio’s Golden Age, based on hundreds of archived rating reports published by Crossley, Hooper and Nielsen. 1. Which network placed the most programs in the Annual Top 50 lists during the Golden Age? 2. How many Top 50 programs did Mutual originate over those 21 seasons? 3. In what broadcast season could CBS first boast of having more Top 50 shows than NBC? 6. Which had the longest string of consecutive months as Network Radio’s highest rated show? 8. Whose popular orchestra had most Top 50 programs? 9. Which singer’s program was the highest rated over a single season? 11. Which of these Misters of Mystery enjoyed the most seasons as a Top Ten program? 12. Which of these popular Doctors operated with the highest ratings? 13. What audience participation quiz was highest rated in its peak season? 15. Which of these dramatic series had the most Top 50 seasons? 19. Who made the first network jump from NBC to CBS? 20. Which music series had the longest uninterrupted run of the Golden Age? 22. Which was the only comedy team ever to have a season’s Number One program? 24. Who achieved the highest single season rating of Network Radio’s Golden Age? 25. Which two programs were rated the season’s Number One show more often than any others? Several of the correct answers that follow might elicit surprise or even an objection. But the numbers don’t lie. As noted in the beginning pages of Network Ratings, 1932-1953, commercial broadcasting has always been a game of numbers - ruled by dollars and dictated by ratings. I was fortunate to discover those ratings, put them all into context and find hundreds of stories behind them. 1 C NBC placed 503 programs in the annual Top 50 lists from 1932-53. CBS followed with 425 and Blue/ABC trailed with 128. The total, (1,056), is the result of ties for 50th place. 2 B Only two Mutual programs, Gabriel Heatter’s nightly newscasts, (1944-45), and The Roy Rogers Show, (1950-51), were ranked in any season‘s Top 50 during the Golden Age..
3 A In 1935-36 CBS broadcast 20 of the season’s Top 50 programs to NBC’s 18 and Blue’s 12. Nevertheless, NBC originated seven of the season’s Top Ten shows . 4 A ABC’s coverage of the Joe Louis-Billy Conn Heavyweight Championship fight of June 19, 1946, was sponsored by Gillette and scored a knockout 67.2 Hooperating. 6 B Ventriloquist Edgar Bergen rang up 22 consecutive monthly wins beginning in September, 1937. Lux was first for 15 straight months and Eddie Cantor won 14 - when he appeared. 7 A Bob Hope & Red Skelton tied for Number One in 1942-43 with 32.3 Hooperatings. Carried to the next decimal point Hope won by six 100ths of a point - too close to call. 8 C Wayne King, “The Waltz King,“ had eight shows that made the annual Top 50 - including three in 1936-37 alone. Benny Goodman’s band appeared in two Top 50 programs, but Glenn Miller’s Moonlight Serenade never rose above 96th place in three prime time seasons. 9 C Maxwell House Showboat with singing star Lanny Ross hit second place twice. Bing Crosby’s best were two seasons in fourth place. Your Hit Parade was never a Top Ten show. 10 C Lowell Thomas outpaced all other nightly newscasters with 15 Top 50 seasons. H.V. Kaltenborn had five and Edward R. Murrow had none. 11 B Mr. District Attorney recorded three Top Ten seasons from 1942 to 1945. Mr. Chameleon hit the Top Ten once, but Mr. Keen never reached higher than twelfth place over its 16 seasons. 12 B Doctor Christian starring Jean Hersholt enjoyed twelve Top 50 seasons from 1939 to 1953 while both Crime Doctor and Doctor IQ each had three Top 50 finishes. 13 A Groucho Marx’s You Bet Your Life registered three Top Ten seasons beginning in 1950. Kay Kyser finished in the Top Ten twice but Take It Or Leave It never rose above 15th place. 14 C Marie Wilson’s My Friend Irma, was Number Five in 1949-50, her third of four Top Ten seasons. Eve Arden’s Miss Brooks placed sixth in 1952-53 and Fanny Brice’s Snooks was eighth. in 1942-43. 15 B One Man‘s Family was prime time’s radio’s longest running serial and compiled twelve Top 50 seasons. Anthologies First Nighter and Screen Guild each enjoyed ten years in the Annual Top 50..
16 B William Boyd parlayed his Hopalong Cassidy television fame to 14th place in the 1951-52 season. Gene Autry’s highest rank was 16th but The Lone Ranger never rose above 35th place. 17 B Big Town scored twelve Top 50 seasons in its 13 years on the air. Semi-documentary The Big Story had six Top 50 finishes and Casey, Crime Photographer registered four. 18 C Ralph Edwards’ Truth Or Consequences hit the ratings jackpot with a sixth place finish in 1947-48, its highest of twelve Top 50 seasons. No other giveaway show came close to this record. .
19 B Eddie Cantor took his top rated NBC show to CBS at mid-season in 1934-35. Amos & Andy made their first move to CBS in 1938. However, Fred Allen jumped from CBS to NBC in 1933. 20 C Voice of Firestone aired on NBC for all 21 years of the Golden Age, Kraft Music Hall for 18 and Manhattan Merry Go Round for 17. Cities Service Concerts also ran for 21 straight years but under three different titles and formats. 21 C Jack Benny and Walter Winchell each made the Annual Top 50 in all 21 seasons of the Golden Age from 1932 to 1953. 22 C Fibber McGee & Molly were Number One in 1941-42. The Jim & Marian Jordan sitcom also finished in second place a record seven times during the 1940’s. 23 B Over his 16 seasons on the air, ventriloquist Edgar Bergen (& Charlie McCarthy) never finished below seventh place.. Benny dropped out of the Top Ten twice and Hope failed to reach the Top Ten six times. 24 B Eddie Cantor turned in a stratospheric Crossley rating of 55.7 for the 1932-33 season. 25 A The Bob Hope Pepsodent Show and Lux Radio Theater were each Network Radio’s Number One show five times for a total of ten of the Golden Age‘s 21 seasons. Cantor’s three first place finishes combined with Benny’s four account for seven seasons. Bergen took season honors twice and Bowes topped the list once. Fibber McGee & Molly’s one first place finish - plus Red Skelton’s virtual tie with Hope in 1942-43 - round out the list of winners at eight. 2. Which star died on the night before his program’s fall debut? A Are You A Missing Heir? 4. Whose show dropped from 29th to 93rd when it was moved to Sunday nights opposite Jack Benny? 1. C My Friend Irma dropped from sixth to 51st place when CBS moved it from Monday to Sunday in 1951-52. Allen fell from sixth to 42nd in 1948-49 when he lost Edgar Bergen & Charlie McCarthy as his lead-in against Stop The Music!. Bowes’ plunge began in 1941-42, slipping from eighth to 21st and then steadily down to 106th place when he retired in 1945. 2. A Singer Buddy Clark was killed in a 1949 private plane crash on the night before his show was scheduled to move to CBS. Marlin Hurt died in the midst of his initial season on CBS in 1946 and Will Rogers was killed in an Alaska plane crash with aviator Wiley Post while on his summer vacation in 1935. 3. B Pot O Gold and Are You A Missing Heir? just offered free money. But Goodwill Court dispensed free legal advice. The New York County Lawyers’ Association filed grievance and the state’s highest court prohibited any lawyers or judges from appearing on the program. The popular NBC show folded after twelve weeks..
4. C All three fell victim to Benny when they treaded on his Sunday evening turf at 7:00 Kate Smith took the biggest hit when she fell from 29th to 93rd place in 1944-45 She never returned. to the Annual Top 50 where her Thursday and Friday night shows had been entrenched for eight consecutive seasons..
5. A After the star-studded giveaway show Hollywood Calling failed, The Big Show was NBC’s final 1950 attempt to blunt the CBS raid of its Sunday stars, Jack Benny, Amos & Andy, and Edgar Bergen. It was a two season extravaganza that never ranked near the Top 50. Jimmy Durante’s Jumbo Fire Chief was a costly NBC flop from 1935, but nothing approached The Big Show fiasco. Network Radio‘s Golden Age was filled with stories of winners and losers. Network Radio Ratings, 1932-1953 reports those stories by the numbers as they happened. Yet, the colorful characteristics of the era, its people and programs shine through every chapter. That remains the fun of it all for me and I hope for those who share my journey through broadcasting history.